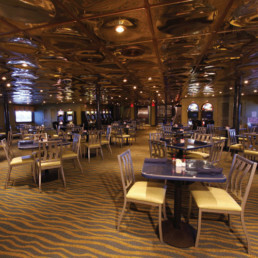 Offering a full-service buffet on Deck 1, this café is the perfect backdrop for an amazing array of mouthwatering dishes. From a carving station and delectable entrees that change daily to classic comfort foods, seafood and salads, you’re sure to find something to satisfy even the heartiest appetite. Be sure to check out our pasta station for our tantalizing pasta dishes. 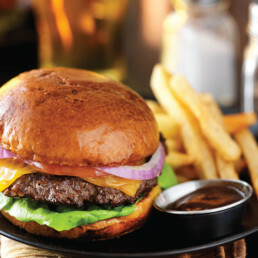 Our à la carte dining menu offers a variety of items such as hand-tossed salads, delicious sandwiches, our famous classic VCC Burger and much more. Don’t forget to save room for one of our delectable dessert items! The outside deck Dolphin Bar on Deck 4 features ocean views, beautiful sunsets, live entertainment and a full bar with all your favorite tropical drinks. 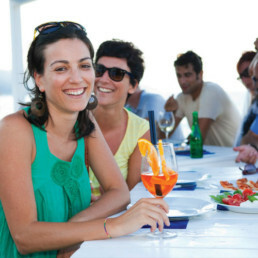 Grab a beverage, a light snack and relax as you cruise up and down the Space Coast. Watch, wager and win on all major sporting events on Deck 1. Order from our extensive á la carte menu. 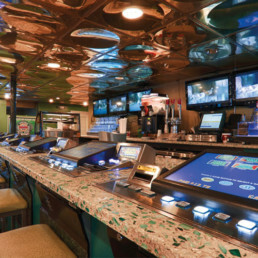 Sportsbook Lounge features comfortable table seating, wall-to-wall TV screens and an expansive bar lined with video poker screens.